At the end of spring last year we had unseasonably hot weather. Then we had a mild summer before the heat came back for a last (hopefully) blast in early autumn. We chose late spring and early autumn to fence a paddock on the stock route and this last week has been a doozy. Here are 10 reasons why I am over fencing in March. Heat and humidity – this week the temperatures have been nudging 40 and the humidity has been up there as well. Talk about sweat equity. Blah. Blisters – we didn’t do much fencing over the mild summer so consequently it took all of five minutes for blisters to break out on my hands, and then burst, and then sting as salty sweat ran into them. Coolatai Grass – the mild summer was complemented by beautiful rain and the grass went crazy. Subsequently, in March as we start fencing again, it is as high as my hat. Coolatai Seed – not only is the grass tall but it is also in seed; sticky, resinous seed that glues to everything. Coolatai Mites – not only is the grass long and sticky but it is host to hundreds of tiny insects that bite. Poor Brian has copped the worst of it. He looks like he has the measles and has been itching all week. I only have about two dozen mite bites. Let’s just take stock here for a moment. So far we are hot, sweaty, blistered, sticky, measled and smelly. Paper wasps – usually it is me that gets stung by these nasty little creatures and I blow up like a balloon, but this time it was Brian. He was walloped between the eyes and so now he looks like he has done a round with Mike Tyson – and he still has measles. 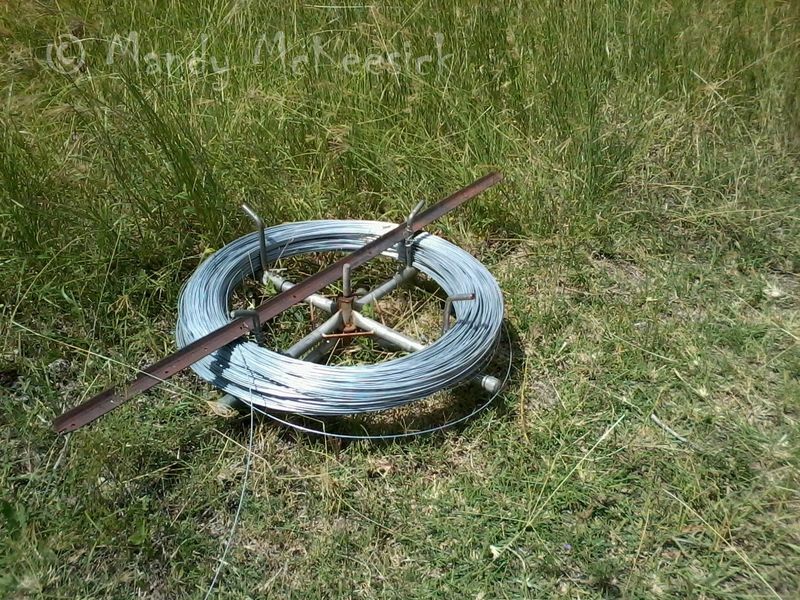 Spinning Jennys – When the wire is coiled correctly and the jenny is spinning gently all is well with the world, but when Brian is towing the wire behind the ute and the coil gets tangled, suddenly there is a manic, tumbling spinning jenny chasing you down the fenceline. A spinning jenny – if you’ve never seen one of these try and keep it that way. 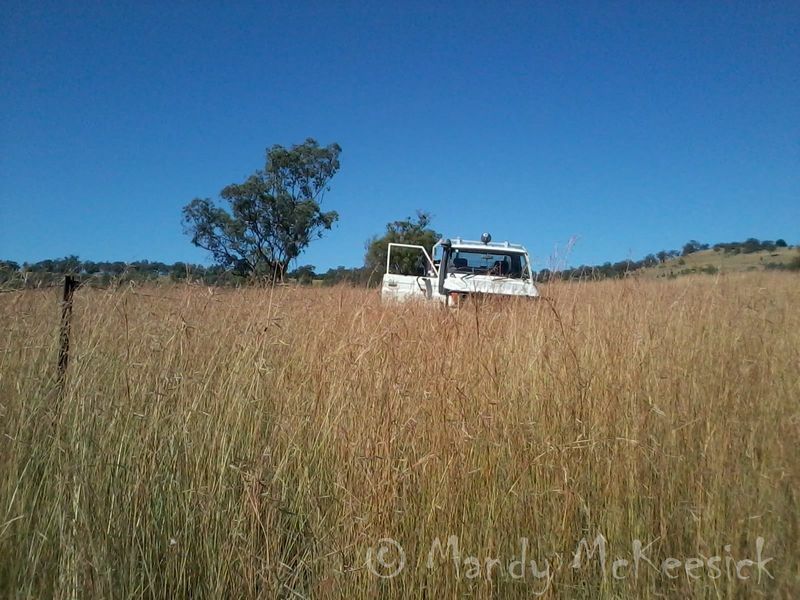 Blady Grass – sitting under a tree one lunch time I asked my measled, battered husband what he would prefer: walking face-first into a spider’s web or walking through blady grass? He chose the blady grass. I chose the spider’s web. Blady grass grows thickly in wetter areas, thick enough so you can’t see what you are walking on, and it hisses and slithers in the wind, much like the snakes that inhabit it. Blady grass gives me the heebie-jeebies. Grey Nomads – these retired travellers peer at us as they zoom along the road in air-conditioned comfort. I tell Brian that should we ever become grey nomads and see hot, sweaty, blistered, sticky, measled, smelly, battered, heebie-jeebied people at work we will stop and offer a hand, or at least a cold drink. He tells me I might be over fencing by then. I can only wonder what makes him think I am not over fencing now. 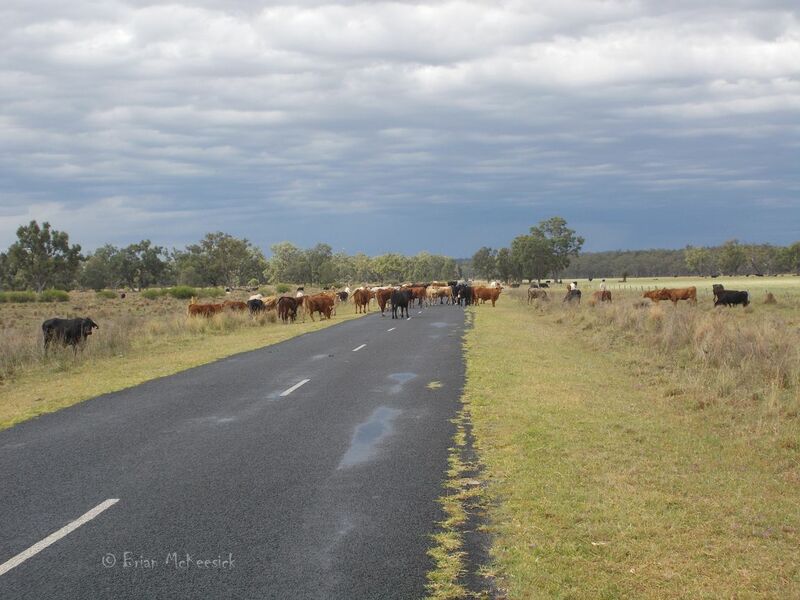 This entry was posted in All in a Day's Work and tagged agriculture, australian farm life, Coolatai grass, fencing in summer, rural Australia. Bookmark the permalink. It is hard work you and Brian do, Mandy! We use fence wire for grape trellising, which is hard enough to work by hand. I can’t imagine stringing up fenceline. For a moment I thought Grey Nomads might be another name for the Sowbugs we have here. An English visitor once told us they were called the “Little Grey Men” where she came from. We are losing a bit in translation Lavinia! I am sure Laurie and Judi (see above), my favourite grey nomads, would laugh at being compared to a creepy-crawly bug. Imagine my confusion looking at bugs with our visitor and wondering who on earth were these “little grey men” she was referring to! Wow. You had me at hot! I guess if you didn’t laugh you’d cry…at least I would! I should have been crying. When we completed the fence we put a brand new electric fence energizer on it. Less than a week later there was a heap of rain, the creek came up and totally flooded the energizer. So it now doesn’t work – and I haven’t even paid for it yet! Who’d be a farmer?